Fiona McDonnell was invited to attend the Take Heart Premiere at ACMI cinema on Thursday night. 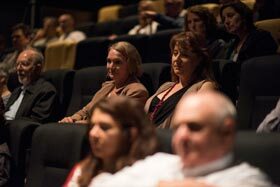 After the screening of the film she felt so impassioned she wrote this letter to The Hon Sussan Ley MP – Minister for Health as Fiona felt it was the first best step she could take in helping tackle the problem of Rheumatic Heart Disease. I was invited to an event in Melbourne last night that sorely troubled and disturbed my sense of pride as a citizen of our Country. Australia is regarded as one of the wealthiest nations in the world. In my heart I have always held our attitude to the health of our people in a place of high esteem and been proud of our humanitarian stance on health care. Imagine my horror in finding that a disease that reached plague proportions in the 1950’s within our non indigenous population and has been all but irradiated in this population is rife amongst our Indigenous Australians today – and it is 100% preventable. Rheumatic Heart Disease (RHD) is decimating our first peoples reducing young children to sit on the sidelines of their life which will tragically be a very short life. Please do all in your power to address this horrendous imbalance in our society, a program for early detection – simple as swabbing sore throats for strep will save lives and ultimately public funds. I have included a link advertising Take Heart (the movie I viewed in Melbourne last night) it also has the details of Moonshine Movies and the very brave ordinary Australians who have to a large extent self funded this Movie to highlight an issue we should all be taking to heart. Thank you and please, please make me proud again.